Train in an accelerated format at your location (training at work, home, you name it - we come to you!) using the knowledge of the industry's leading professionals, presented in an entertaining and informative manner. Our OSHA Safety Training Classes are offered in a "corporate style", streamlined format ~ designed to comply with most current OSHA, ECC/ILCOR and other National regulations, yet still saving time and money by cutting out unnecessary breaks and video time. First Aid Training, CPR Courses , AED, BBP + 100 other safety topics! 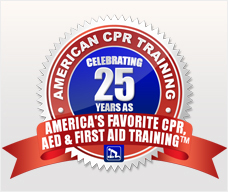 American CPR Training™... Be sure to try our On-Line Price Quote Form for group training at your facility...CPR, First Aid, AED, BBP, Forklift & OSHA Safety Classes. American CPR Training™ also offers all aspects of Environmental Health & Safety consulting, training, products, management, and services. See our other exciting products including Professional CPR & First Aid Training Mannequins, CPR Masks & CPR Mouth Barrier devices, First Aid Kits, even American Red Cross products. Also see our Safety Training Videos, CD's and Kits, and our NEW A.E.D. Grant Program. ACT™ is excited to offer multimedia training presentations on CD Rom, Disk, or Video in DVD & VHS formats, beginning at Just $49 ~ Spanish Training Too! ACT™ is proud to be home to the first and only American Heart Association Approved "Learn at Home" CPR programs including CPR Anytime! These programs come complete with instruction DVDs, student workbook, and up to TWO Mannequins for practice and review so you can keep your skills fresh... ALL FROM ONLY $34.95! ACT™ now has more to offer! Look for 1000's of new First Aid Products in our CPR & First Aid Supply Store! safety service providers have served so many concerns, from Mom & Pop, to many Fortune 500 entities. Contact us about adding your name and link to our VIP list. NEWEST CPR Guidelines RELEASED - Read New CPR Steps Here! & New CPR DVD Video! Watch the Online Preview & ORDER NOW!